We continue the series of posts on Marketing Techniques for eCommerce with the use of Content Marketing. Those of us who work in Digital often talk about the voice of the consumer, content marketing, and content curators. But the reality is obvious: content is prince and user is king. Do we write for the user? In an online store it is quite something to say that product descriptions in addition to mere SEO can help you sell or not. This post is not meant to rediscover the wheel, but rather about how to correctly apply Content Marketing in your eCommerce store, and how to benefit from it. Our friends at Findability have created this simple infographic which summarizes the new rules of content marketing for your company or your eCommerce store. The greatest danger for online stores is not updating, particularly as regards SEO. Publishing contents on a regular basis (the more and the higher quality the number) solves this problem. Content marketing is very good to explain in depth what you are offering, finding new benefits, making use of industry news to promote them, etc. We are not only talking about SEO positioning, but also about Social Media. Pinterest can provide many benefits. Own contents are added value for your social profiles – using third-party contents is just a shortcut for your audience. A good content strategy will turn social networks into a source of traffic and potential sales for your business. “Content marketing is interesting for online stores when you have something to tell the world about the differential value of your products or services”. Which contents should you publish in an online store? 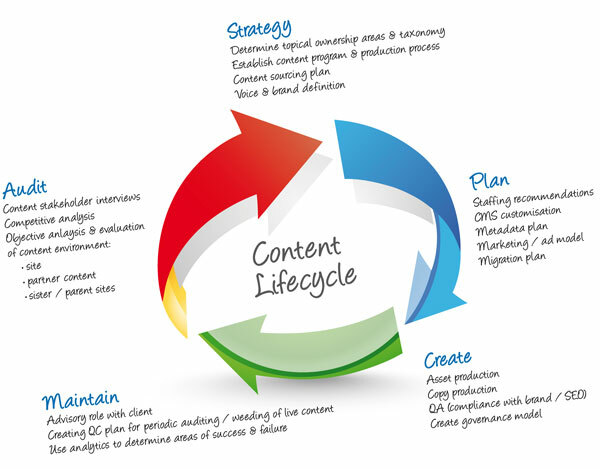 Your content marketing strategy should adapt to your target and industry. Some types of contents can be used by all companies, others are more suitable for certain domains. In the end, the secret is thinking about who you want to be found by, and giving them what they are looking for. Be careful and use in moderation! Of course, your blog is a great tool to communicate news or follow a corporate communication line, but don’t turn it into a mere loudspeaker. If you are in a very changing industry with constant news, it might be a good idea to publish a post about what’s new, or a regular compilation of highlights, etc. For example, there are online stores specializing in technology, fashion, literature, etc. or in which the product stock changes all the time. If you sell an innovative product or service, explain it as best you can. What it is, how it works, and what its benefits are – these are aspects that should always be included in your online store. Creating manuals that can be downloaded for free from your website (for example, as a PDF file) generate trust among users and encourage them to visit your website not only to buy but because they know that you are an influencer for the product or service in question. Online Marketing Manager at BrainSINS. SEO, SEM and E-Commerce.